Bantamweight champion Ronda Rousey (pictured) became the UFC’s golden girl after February’s sensational debut victory over Liz Carmouche. Rousey could have done or said almost anything at that point and could still do no wrong. Fast forward past a contentious stint as coach on “The Ultimate Fighter 18” against bitter rival Miesha Tate and Rousey can now seemingly do no right. To most viewers, Rousey came off as a bully – as well as another B-word – on the reality series and her image took a steep nosedive. She even lost to Tate in the opening round of EA Sports’ fan-voted tournament to score the cover for their UFC video game. The mere thought of that happening would have been absurd before the show debuted in September. In fact, Rousey probably would have easily scored the video game cover had voting taken place just three months ago. Rousey claimed she was being “real” on TUF, while accusing Tate of being “fake” for the cameras. Nonetheless, this isn’t “Keeping up with the Kardashians.” It’s mixed martial arts, where winning cures everything. That is unless you win and show poor sportsmanship immediately after. 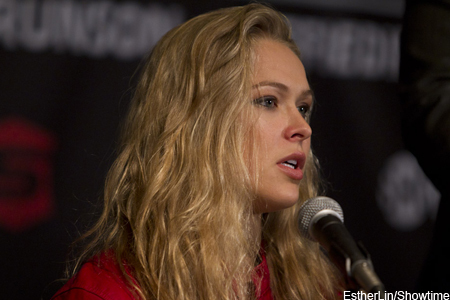 Rousey entered UFC 168 as a significant 7-1 odds-on favorite to steamroll Tate. Although she wasn’t able to finish things off in the opening round, like she had done to all seven of her previous victims, including Tate once before in March 2012, Rousey ultimately sealed the deal in the third stanza with her trademark armbar. However, the image ingrained in fans’ minds isn’t of the highlight reel maneuver, it’s of the low class move she pulled after by refusing to shake Tate’s hand when her defeated opponent tried to congratulate Rousey on the win. The crowed immediately pelted Rousey with boos. They really let the “Rowdy” one have it during her in-cage interview when she made no apologies. In fact, the 26-year-old simply made things worse with each passing word. Tate, on the other hand, was given a standing ovation during her post-fight speech. During Fox Sports 1’s post-fight show, Rousey was once again given the opportunity to make things right, but didn’t because she’s adamant about keeping it real. “Well, like I said in the interview, I went to 30 different countries in judo and I got booed everywhere,” Rousey stated. “Getting cheers is something new to me, and I really feel being the good guy and acting all perfect, it leaves no room for error. I don’t want to have to be stuck in that perfect role. But if Rousey’s constantly changing roles, how is that keeping it real? In fact, isn’t that the exact definition of, dare I say, fake? Just something to think about before she tries to leave the heel role behind.